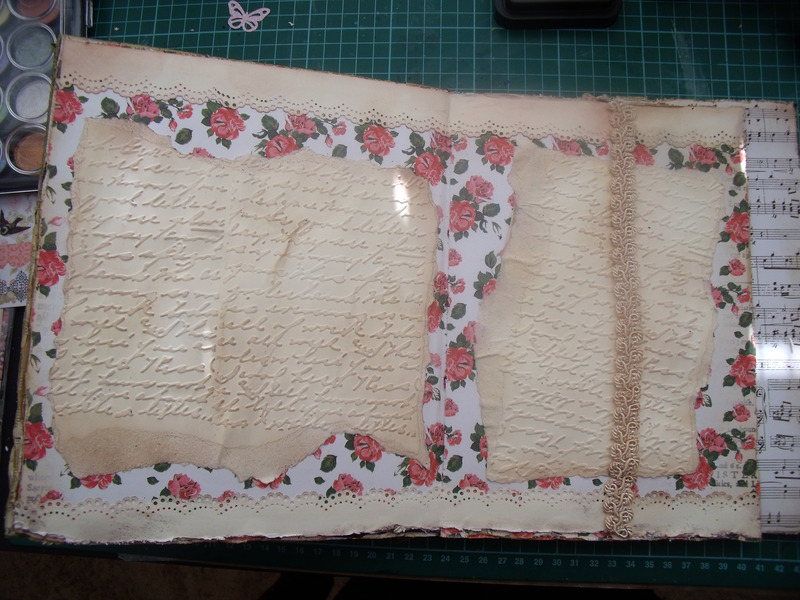 I’ve been working on different embellishments that will be added into the book – most of them still requiring finishing touches as I kept running out of supplies – and as I buy most of my stuff on-line there can be a five day delay between ordering and receiving. So consequently all I have to show at the moment is the layering process which is underway. What you are about to see is simply phase two and there are at least another two steps to be taken in this process – And just to keep your interest up [hopefully] I’ll finish with a quick peek at a possible phase three page. 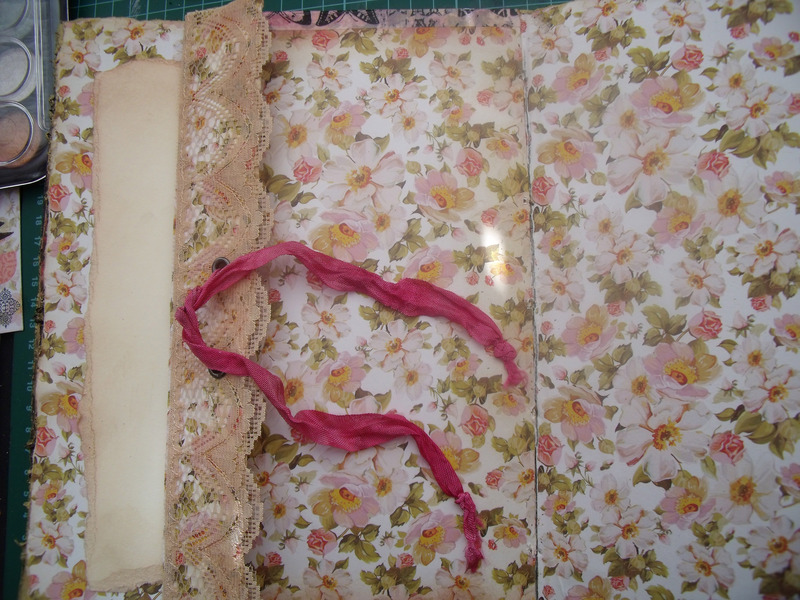 The strip of fabric edging on the right side is loose so that more pages can be tucked under it later on. Most of what you can now see will soon disappear…..
A close-up of the lower left page. 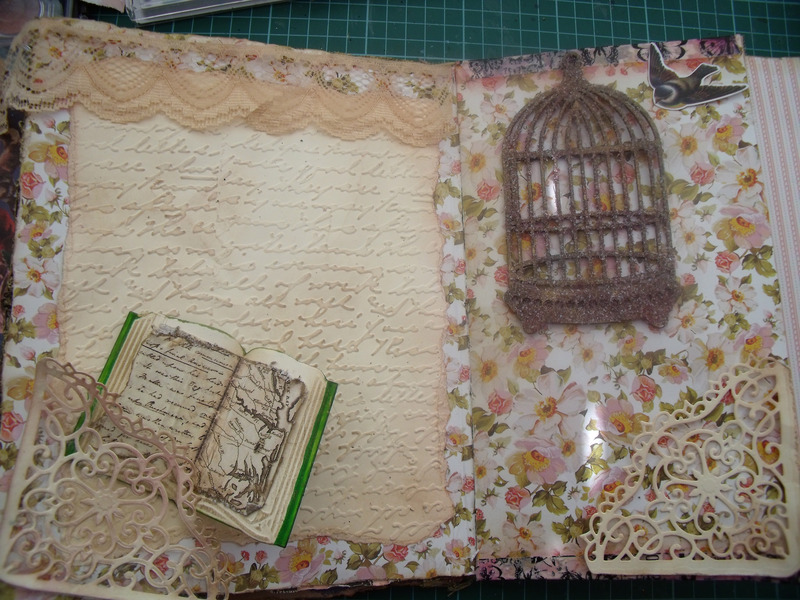 This is a page towards the front of the book – it’s actually two pages as the curved part is the edge of a flip page, narrower and incorporating a pocket for more embellishments to be tucked into, and the bird belongs on the following page – I quite like that you can see this glimpse of what comes next..
Another flip page, made to look like an envelope with lace edging and ribbon tie. Well it doesn’t just look like an envelope, it is an envelope and will hold a couple of poems inside. Thanks for taking the time to drop by – I love that you came! 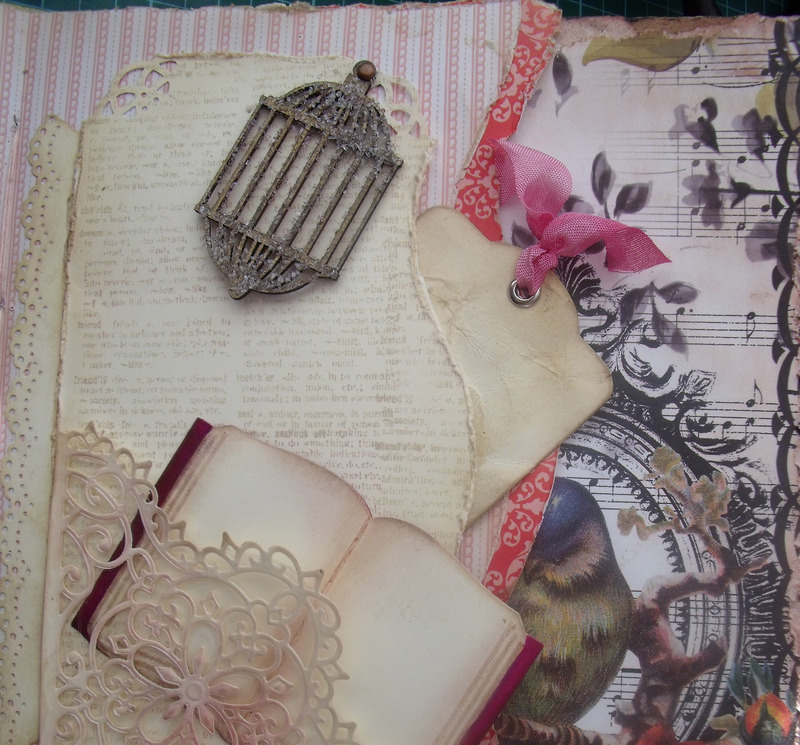 This entry was posted in Creations From My Craft Room and tagged Box to Book, Craft, dry embossing, Envelope, Khalil Gibran, Mixed Media, Paper Crafting, Rumi by thecontentedcrafter. Bookmark the permalink. Holy, that little pocket is crazy beautiful. That’s a piece of lace? How do you adhere it in there permanently? Are the tiny books vintage? That little pocket is made from a die which I backed with some packaging plastic. 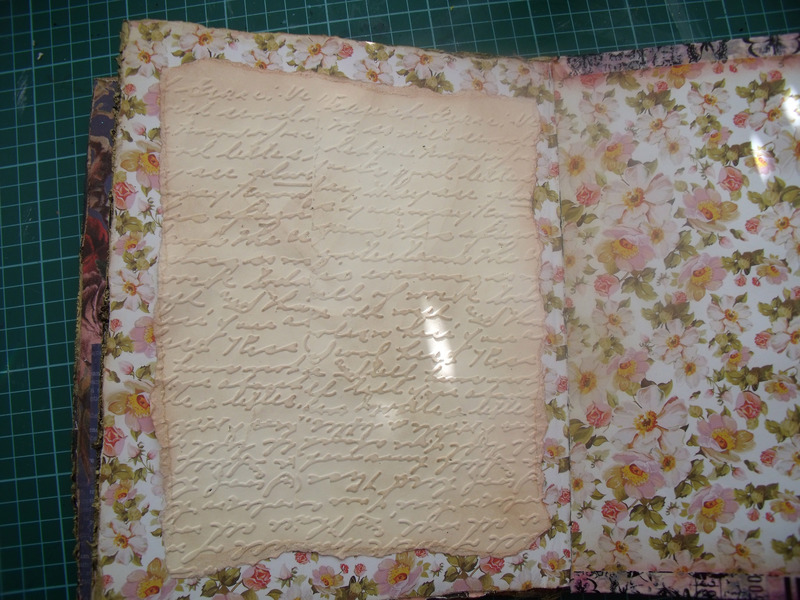 The little books are also made with a die which I then paint and letter up and muck around with to make them look old. Even the real lace has been tea dyed to age it and ripped a bit to tatty it up. There is genuinely nothing in this book that has not been made and aged either entirely or partly by my fair hand 🙂 Also that page now looks totally different – you probably won’t recognise it at all! You should work for Lucas…as in George. I can’t imagine such a gorgeous die cut. Amazing to see it all together. I’m looking forward to that share. I’ve been working (trying to) with Faber Castel Gelato’s for two days. It’s part of a page challenge at my new job so I’m a we bit nervous. I did one background page that I didn’t like….too busy. So I’m starting over, I do have all the scrappy things planned out and photographed though. What I didn’t like is after I Gesso’d the paper it got all wrinkled, so I ironed it. Then I added Texturing Paste thru a stencil and again with the wrinkles. So after that dried, I ironed it between two heavy paper bags. Then I added the Gelato’s and tried to blend with a bit of water…again my paper got all rippled. How do you get all these products on without rippling the paper? What kind of paper are you using – it sounds like it might be too light. Make sure you have water colour strength paper – the heavier the better. I use at least 160gsm and prefer around 300gsm. 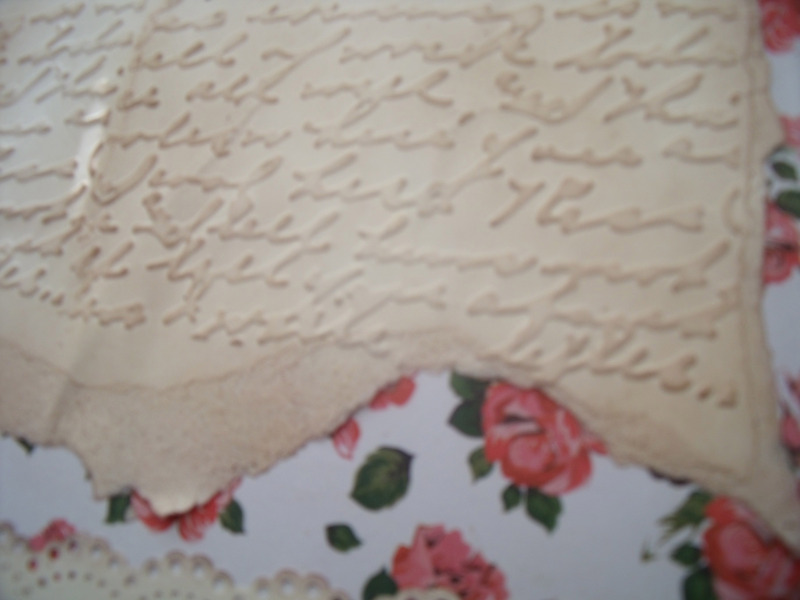 Also some wrinkling will happen when paper is wet and will smooth itself out on drying. You just have to experiment….. I did buy 300 gsm at a discount price for watercolour painting…works like a dream. This is just a scrapbook card stock. The kits are put together for us. Each person makes their own design from the exact same materials. No substitutes and no additions. It’s fun to see how everyone does it. Thanks for your help 😀 I may be looking for your expert advice again since they’re going into art journaling big time. This is beautiful, a real treasure.